Kate and I left Brooklyn at about 7:30 AM Monday morning, headed for Point Judith, RI and the ferry to Block Island. We had loaded her car with a few days' worth of clothes, some food for the road, and our bikes. I had my Trek hybrid and Kate had an old 10-speed bike she recently bought from a former roommate. We had struggled with her bike on Sunday evening getting the front wheel off to fit the bikes in the trunk, but I had the procedure down to a lean 10 minutes. 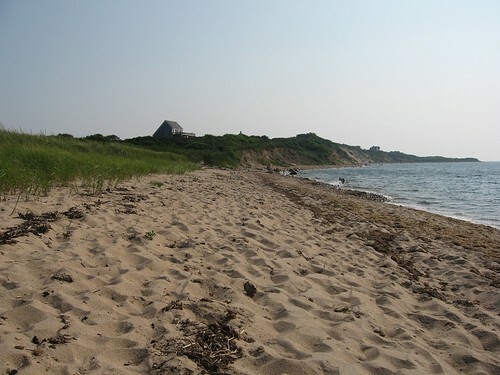 It took us about four hours to reach Point Judith, and we had about 15 minutes to walk a few blocks to the next ferry for Block Island. If we'd missed that boat we would have had to wait an hour for the next one. We walked our bikes and our luggage as fast as we could and got onto the boat with a few minutes to spare. It was a foggy but uneventful crossing, and by the time we approached the island the fog had disappeared and we could see our destination clearly. Once we were off the ferry, we locked up our bikes across the street from our hotel and checked in. Our room wasn't ready so we decided to get some lunch. We walked about a block to Finn's, the closest thing to a "clam shack" on the island. Nearly all of the restaurants and bars on Block Island are within walking distance of the Old Harbor where the ferry docks so we didn't have far to go. Our room was ready right after lunch, so we changed into our swimsuits and rode to the beach. Kate took point and I followed, for two reasons. 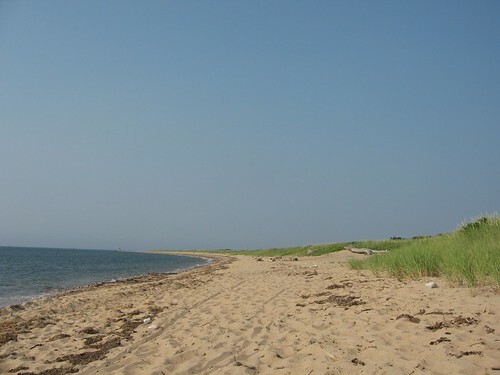 First, she had been to Block Island before and knew her way around. The other reason was that we had had some mechanical troubles with her bike beyond the aforementioned front wheel and I wanted to keep an eye on it. I didn't want to ride up front and leave her behind if her chain popped off, which it did several times that afternoon. We found our way to a rocky but secluded beach on the west side of the island and nearly jumped in the water. It was colder than I expected but refreshing after riding a few miles in the hot sun. We sat on the beach for a few hours, watched a couple of dogs wander past us without paying us any attention, and only saw a few other people. We left a few hours later and nearly got lost on our way back but a few friendly joggers pointed us in the right direction. Along the way we saw a saddled but riderless horse trot past us and make a turn down a driveway that led to a stable. We didn't see a horseless rider following, and I wish I'd gotten a picture of the horse. We ate dinner that night at Beachhead Tavern, a few blocks north of our hotel, and had the first of several lobster dinners that week. The food wasn't bad, but the menus at most of the restaurants were typical beach fare: seafood, steaks, and pasta. The disappointing aspect of the dining on Block Island was that the restaurants didn't serve much in the way of fresh-from-the-ocean seafood. Most of the fish came from the mainland on the ferry.